Ah, the majesty of Christmas. There are many sentiments expressed by the celebration of Christmas and I think one that applies to all Hamilton collectors is "you are not alone". Just as the angel told the shepherds, “Be not afraid; for behold, I bring you good news of a great joy which will come to all the people; for to you is born this day in the city of David a Savior, who is Christ the Lord" - they were effectively being told, rejoice - you are no longer alone, Isaiah's prophecy has been realized. That was cause for such celebration that they dropped everything to go welcome the new baby and honor Him with their gifts. There were two very busy seasons for the Hamilton Watch Company. One was the period of graduations in May / June and the other was Christmas. Presenting a Hamilton watch at Christmas was a great way to show how much you loved someone and it was sure to be a gift that would be treasured for many years, if not a lifetime. 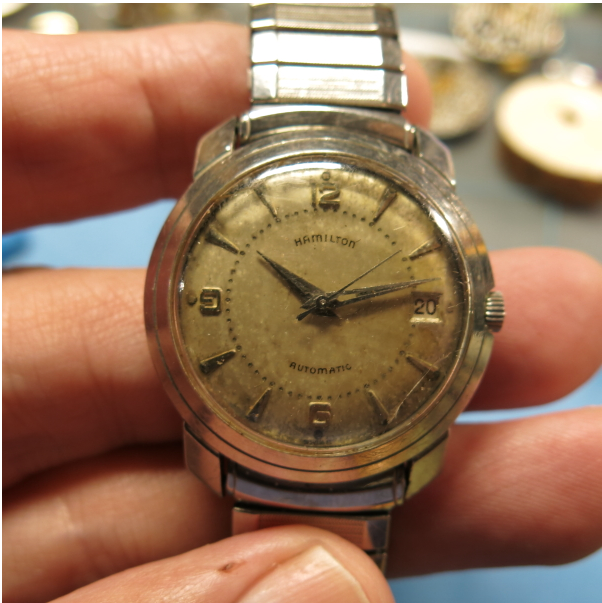 My favorite watches are Christmas watches and I will almost always buy a Christmas watch in need of restoration, even if I've restored the model numerous times before. So I thought on this Christmas day I would share with my fellow Hamilton fans a few recent acquisitions and one special watch from my personal collection. I just finished this very nice 1940 Winthrop the other day. I wish I kept a "before" shot, as it was a mess but I think it turned out great. I showed this 1937 Ardmore back in 2015. Ardmore is a town on the Main Line between Philadelphia and Lancaster. I used to live in Ardmore when I was in college so it's a special model to me. This 1935 Ellsworth is an interesting watch that was also recently completed. It's a man's model but it's a little on the feminine side with a 13mm wide lug width. Apparently "Bert" thought so too, as he gave this watch to his mother on Christmas day in 1935. Lastly, here's a 1956 Automatic K-576 that I recently completed. Check out this transformation! It has a Christmas dedication from 1962. That's a bit unusual since it was several years after it was discontinued but that doesn't mean it wasn't still in a jeweler's showroom. On behalf of the "HandyDan clan", I wish all of my Hamilton Chronicles fans and fellow collectors a holy and merry Christmas. Whether you celebrate the holiday or not, I hope you have a nice week and a joy-filled New Year. Merry Christmas to you as well. Thanks for another fantastic year of Hamilton blog posts and incredible projects. The K-576 is an amazing transformation. The final photo is nice to see, too. Wishing you all the best for 2018!